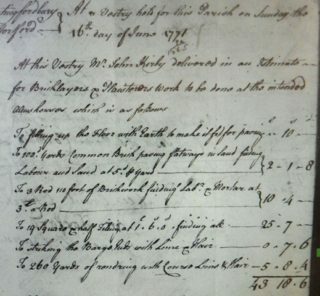 ‘Four lodging houses for the impotent poor’ which had lately stood next to the churchyard are mentioned in an indenture triptite [between 3 parties] of 1773. When they were built is so far unknown, but it is likely to have been by the parish as the land was later purchased from the parish. The parish authorised the building of a replacement almshouse in 1771, which was redesignated as a workhouse in 1772. The last reference to an almshouse is in 1773 although the workhouse continued. 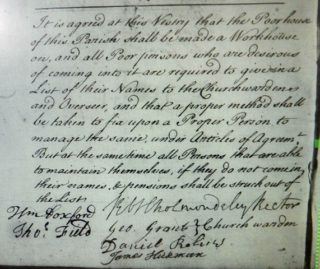 A Hertingfordbury Vestry minute for 15 March 1730 authorised the repair to the pales next to the churchyard belonging to the parish houses, and the Church gates. The location suits the reference to the almshouses (next to the church), but what the buildings were used for is not clear. 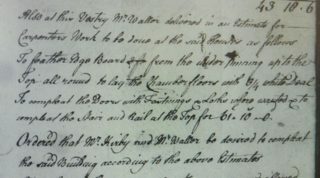 There is a reference in the Jan 7  minutes that the widows Grace Welch and Mary Godfrey would be put in the parish houses as James Devonshire had vacated them, leaving his children as well. Even later there was a requirement that a Widow Godfrey would have to pay her rent. Other references suggest that poor people had to pay rent at various rates. 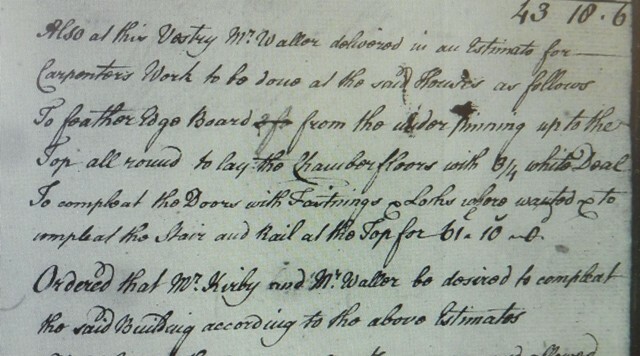 The Vestry meeting of May 16 1759 required the Overseer of the Poor to provide badges for all those in receipt of alms. 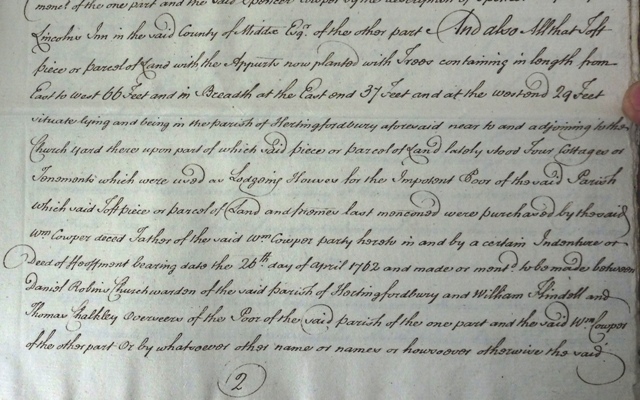 Spencer Cowper, one of the Judges of His Majesty’s Court of Common Pleas, purchased lands in 1717. In 1762 William Cowper (died 1769) purchased some extra land adjoining the churchyard from the Churchwarden and the Overseers of the Poor. This sale does not seem to appear in the Vestry minutes, however. It was small – about 20 metres by 10 metres. By the time the property was sold by his widow and son in 1773, only 11 years after the purchase, the land had been planted with trees. The mention that the almshouses had ‘lately’ stood on the site suggests recent activity. Most of the sale document is legal repetition and detail about the rest of the sale, but it does include the paragraph, ‘Also that Toft piece or parcel of land with the Appurts now planted with trees containing in length from East to West 66 Feet and in Breadth at the East end 37 feet and at the West end 29 feet situate lying and being in the parish of Hertingfordbury aforesaid near to and adjoining the Church yard there upon part of which said piece or parcel of land lately stood Four Cottages or Tenements which were used as Lodging Houses for the Impotent Poor of the said Parish which said Toft piece or parcel of land and [promend] last menconed were purchased by the said William Cowper deced father of the said Wm Cowper party hereto and by a certain Indenture or Deed of Feoffment bearing date the 26th day of April 1762 and made or montd to be made between Daniel Robins churchwarden of the said parish of Hertingfordbury and William Hindell and Thomas Chalkley Overseers of the Poor of the said parish of the one part and the said William Cowper of the other part’. 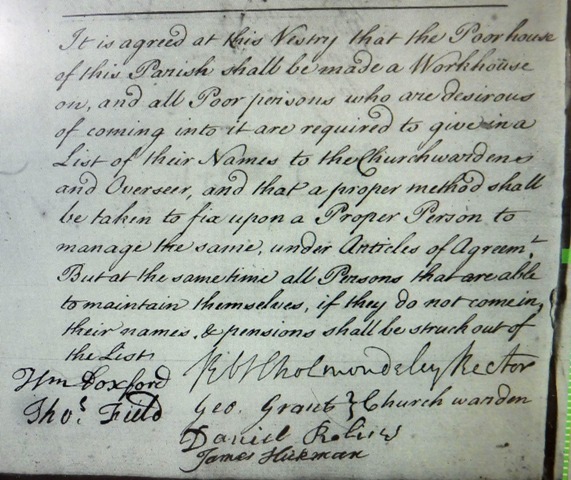 The second part of the story can be found in the Hertingfordbury Vestry minutes. The bills suggest it was built in less than six months. 16th June 1771. Estimates for the building of the intended almshouse were provided. Bricklayers and plasterers would cost £43 10s. 6d. Carpenters would cost a further £61 10s. Mr Kirby and Mr Waller were desired to complete the building in accordance with the estimates. August 1772. The decision was made that the poor house would be a workhouse. 29 January 1773. Half a load of faggotts was to be supplied to the poor of the almshouses belonging to the parish. 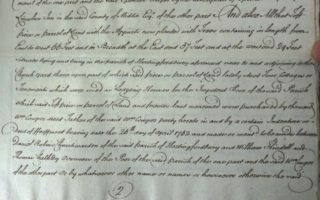 13th June 1773. The glazier’s bill for the almshouse for £2 0s. 6d. (dating from 1771) was authorised. This seems to be the last mention of the almshouse in the Vestry minutes although details about the workhouse were minuted regularly for another 60 years. Paupers in the workhouse as at 24 Feb 1813 included Thos Allon 60, Thos Taylor 66, Jos Davids 70 and Ann Hindell 63. However, age does not indicate any provision of almshouse style accommodation. The meeting of 25 March 1833 noted that the average number of workhouse inmates was 24 (remember that the original almshouses were only four tenements). This was just before the Poor Law reforms of 1834 and the establishment of the Hertford Union in 1835. The lists of Hertingfordbury workhouse recipients cease as of 1836 so maybe we could assume that any almshouse provision had ceased by then, any poor people being the care of the workhouse. This raises the rather fluid distinction between almshouses, poor houses and the workhouse. Maybe one factor was that workhouse inmates had accommodation, clothing and food supplied (with no choice), while almspeople had accommodation but usually had some other income (such as pensions) for their other needs. Workhouse provision may have been a statutory requirement while almshouses were beneficiary. Cussans and Victoria County History do not mention any Hertingfordbury almshouses or likely benefactors. DE/P/F2211773 sale transaction for the estate. Held at HALS. D/P50/8/* Hertingfordbury Vestry Minutes. Held at HALS. Ordnance Survey map Hertfordshire XXIX (Surveyed: 1879 to 1880, published 1884). This map can be viewed on-line at https://maps.nls.uk/view/10234332. While this map is a century later than the sale document it does show the relationship between the church and the grounds of Hertingfordbury Park.